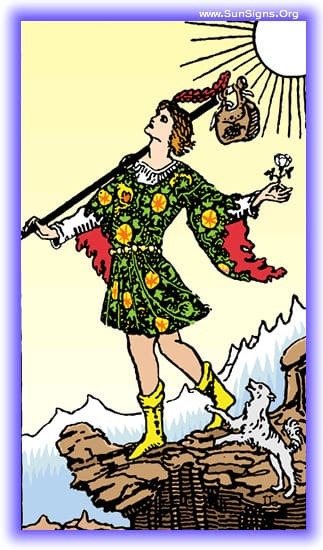 Feel yourself falling into this tarot card, and you will find yourself with the Fool. He will be in the middle of a journey through uneven terrain, but his eyes will be to the sky. He will seem utterly unprepared, wearing the wrong clothes. He will have none of the proper things one might take with themselves for a long journey. He will be happy, and he might have his little dog with him who represents the fortune of naïvety, dancing around his feet and guiding him away from dangers he scarcely noticed. Greet him, but do not be surprised if he does not answer, his eyes are on the future ahead and you will find him day-dreaming with every step. Walk along with him, and try to share his simple optimism and fearlessness. He does not know that they say that what he does is foolish and impossible, but in this he finds strength. For him, all things are possible because no one has told them they are not. Just as when we were children, the future lay wide open to him and all things are possible. In this Fool tarot card meditation, you may feel fear, or challenged by the surroundings and perils of what’s to come. The lesson of this meditation is to let that go, to allow yourself to know that the future is open to you. Know that many things that have been said to be impossible are now a fact. More often than not, it was all because some Fool started down a path heedless of what others tried to tell him. Know that we are all Fools at points throughout our lives, the Fool is the beginning, the start of our journey into the future. The Major Arcana are often interpreted as the path the Fool takes through life, gradually changing and growing with experience. We are fortunate to be here with him at the beginning of his journey, as perhaps it is the beginning of ours. Continue the meditation as long as seems appropriate, experiencing the sensation of newness, the beginning of his journey, and yours. If you have a tarot journal, make notes, record what it felt like to be carefree, or if you were not able to reach that carefree state, try to examine yourself and see if you can decide what kept you from reaching it.